How do the prophetic teachings of Irvin Baxter, Jr., line up with the Bible? I have lately started receiving many inquiries concerning the prophecy ministry of Irvin Baxter, Jr., of Endtime Ministries. His ministry Web address is www.endtime.com. Awhile back when I had originally begun to surf his website, several red flags started popping up. First, I could not find a statement of faith. I looked for a good ten minutes and was about to give up my search, when I stumbled across a statement of faith in a very peculiar location. It was on the page where you enter your name and address to subscribe to his prophecy magazine. It is now located under "About Us." The statement provoked continuing concern. It was vague and general in nature, consisting of only three sentences. When I run across such statements, they always prompt me to wonder if the person is hiding something. It has been expanded a little bit since. That question may have been answered by the next red flag I encountered. It was on the ministry's links page, the page where links are supplied to other websites. Only eight links to "religious sites" were supplied, and three of those were links to sites affiliated with the United Pentecostal Church, a group that denies the foundational Christian doctrine of the Trinity. The third red flag I encountered was also on the links page. I noticed that there was not a single link to another prophecy ministry. (We have over 25 links to other prophetic ministries on our web site and many links to Messianic ministries, many of which are prophetic in nature.) This glaring omission caused me to assume that Mr. Baxter must have some off-the-wall prophetic interpretation that no one else agrees with. That assumption was to prove true. The meat of the website is to be found on the "Frequently Asked Questions" page, now titled "Urgent Questions." It doesn't take long to discover that Mr. Baxter is a person with a very personal and unique interpretation of Bible prophecy, something we are warned against in the Scriptures (2 Peter 1:20). It would take more space than I have available to summarize and counter all of Mr. Baxter's unusual interpretations of prophecy, so I will mention only a few. He denies that Revelation is written in chronological order. He does not, therefore, believe that the Seal Judgments will be followed by the Trumpet Judgments during the first three and one half years of the Tribulation — as the plain sense meaning of Revelation indicates. He takes this position because he argues that several of both the Seal Judgments and the Trumpet Judgments have already taken place! The normal, plain sense interpretation of Revelation 6 is that it marks the beginning of the Tribulation with the Antichrist going forth on a white horse to conquer the world. A world war ensues, and one-fourth of the world's population dies from war (the red horse), famine (the black horse), pestilence and wild beasts. Mr. Baxter argues that the fulfillment of the Seal Judgments has nothing to do with the Tribulation. He asserts that the fulfillment of these judgments began in 325 AD when the Emperor Constantine presided over a Church Council that produced the Nicene Creed (a creed, interestingly enough, that laid the foundation for the doctrine of the Trinity). In short, he identifies the white horse of Revelation 6 as Roman Catholicism, the black horse as Capitalism, and the red horse as Communism. This all makes for very interesting reading, but it simply is not sustained by the text, for it violates the plain sense meaning. Another example of Baxter's off-the-wall style of interpretation is found in his assertion that the world empires revealed to Daniel in Daniel 2 include the Holy Roman Empire. He sees the succession as Babylon, Medo-Persia, Greece, the Roman Empire, and the Holy Roman Empire. That is not the succession portrayed in Daniel 2. The Roman Empire is followed by an empire of iron mixed with clay — representing the unstable, final world empire of the Antichrist. The proof that this is the last empire of history is found in the fact that this is the empire that is suddenly destroyed by a stone that represents the kingdom of Jesus Christ when He returns. There is no place in the scenario for the Holy Roman Empire, which was an empire in name only. Baxter tries to insert the Holy Roman Empire because he wants to argue that it is the one that will be revived in the end times, rather than the Roman Empire. And he tries to advance this argument so that he can sustain his contention that the "fatal would that will be healed," referred to in Revelation 13:3, is a reference to the Berlin Wall being removed so that Germany (which was the heart of the Holy Roman Empire) could be reunited. Mr. Baxter does further damage to the book of Daniel when he contends that the symbols used in chapter 7 refer to Great Britain, Russian, and Germany. Again, this runs contrary to the plain sense meaning of the passage. In Daniel 7, God gives Daniel a vision of the same succession of empires as he was given in chapter 2. The difference is that in chapter 2 they are seen from the viewpoint of Man — as glorious political kingdoms — whereas in chapter 7 they are presented from the viewpoint of God — as ravenous wild beasts. One of the strangest statements on Mr. Baxter's website concerns the Rapture. In response to a question about the timing of the Rapture, he says, "Unfortunately, rapture timing debates between brothers in Christ often become divisive, and for this reason, Entime has chosen to avoid the issue for now." I was astonished by this non-answer. Here is a person with an opinion on everything in the prophetic scriptures, yet he chooses to "avoid" one of the most important issues! It didn't make any sense to me. I was even more astonished when I continued reading, for in the very next paragraph, Mr. Baxter states that he believes that the Rapture and the Second Coming are "the same event." Well, if they are the same event, then the Rapture must take place at the end of the Tribulation — so much for "avoiding" the issue. To sustain this position, Mr. Baxter proceeds to try to explain away some passages that imply a pre-Tribulation Rapture. In doing so, he presents the most peculiar and bizarre interpretation of 2 Thessalonians 2 that I have ever run across. The passage states that the Antichrist cannot be revealed until that which restrains him is removed. I believe this is talking about the Church since the Church is the entity that the Holy Spirit works through to restrain evil in the world. Mr. Baxter contends that the restrainer is "time." Yes, time! It's just not the right time for the Antichrist to be revealed, he says, and when the time is right, the revelation will occur. Well, I would agree with that, but the statement fails to deal with the question of what is going to be removed? How do you remove time? Mr. Baxter' approach to prophetic interpretation makes it clear why the plain sense meaning rule is so important. That rule states: "If the plain sense makes sense, don't look for any other sense, or you will end up with nonsense." As with Mr. Baxter, you will end up with a very personal interpretation that no other prophecy teacher is willing to endorse. I urge caution with regard to Mr. Baxter and his unique interpretations. Remember 2 Peter 1:20 — "No prophecy of Scripture is a matter of one's own interpretation." Frank Stagg in his book, How to Understand the Bible, says, "God does not grant private disclosures that are withheld from other people." 1 Corinthians 14:29 says that when a prophet speaks, his words are to be evaluated by others, for "the spirits of prophets are subject to prophets" (1 Corinthians 14:32). This essay has been written in the spirit of that admonition. I am thankful that Mr. Baxter is emphasizing the Lord's soon return, but at the same time I urge great caution regarding his very personal interpretations of Bible prophecy. According to your link on this page to "Who's Who in Bible Prophecy?" this guy is a bad apple. Good point regarding links to other prophecy sites. This can sometimes be quite revealing. Dewey Bruton's links are a red flag! Thanks for this write-up; I'm a fan of L&L Ministries on DirectTV and I came across Baxter's show. Despite some slick production value, I soon realized his eschatology was way off...thank God for ministries like L&L that preach "solo scriptura"! I am confident Baxter is like all the self proclaimed prophets and apostles running around to day – all fakes imho. What does Baxter make of Israel and the Church – as he isn't following a literal interpretation, then its allegorical? From my unpleasant experiences they are 'replacement' to one degree or another. Not all replace Israel with the Church completely; which is deceiving, but do teach God has only one people (because) the 'church' (ecclesia means a gathering) was in the wilderness with Moses (Acts7:38) so – the church existed in the O.T. and wasn’t born in Acts 2. Some say the O.T. saints are not the church, but they are the ‘body of Christ’????? Here’s a clue in his 2nd Statement. Not so, the gospel of the kingdom concerned Israel for the Messianic Rule on planet earth with Jesus seating on David’s throne. As the religious leaders rejected Jesus, THE Gospel preached by the Church of Jew AND Gentile is 1Cor.15:1-4. This suggests to me Baxter is a form of confused ‘replacement’. Thanks for the evaluation of Irvin Baxter! I listened to him but no longer! Irvin Baxter is no false prophet. You call him that because you have believed a lie so when the truth comes out you deny it. Bro Baxter was the only prophecy teacher to teach that the Berlin wall would be torn down,& he wrote in his book "A message for the president" written in 1986 3 years before it happend. He uses the Bible to support his views and believes. I listen to alot of Bible prophecy teachers because I think they all have a piece of the truth about some things and like listening. Now I dont listen to seventh day adventist nor Jahovah witnesses but I do listen to Irvin Baxter because his teaching makes more sense and alot of what he has said has come to pass. I don't believe him just because he sounds good but he backs it up. I understand that we need to watch for false teachers but Irvin is definetly not that, he is a true man of God.I believe he speaks truth and he does not teach replacement theology like one person said.I dont believe in replacement theology and know that he doesnt teach that. I do see that and I'm not saying that you do this but I see some bible prophecy teachers are competing on whos the best teaching or so-called Pride. This doesn't need to be . I believe he's got alot of truth and just because some have a different view on when the rapture will take place shouldnt be fighting about it but just be ready at all times and Irvin says that often. Just like alot dont believe United States is in the bible but I can see where it is. It is every Christins duty to challenge a minister or teacher or even a false prophet. I liked listening to I. Baxter, but soon caught on that he didn't back up his teaching, nor could I. I tried believe me, but failed. All scripture can be referenced from New to Old. When you get stuck, try going to the original writings. Still it didn't hold up. I try to be impartial. He is expecting a World War when Pslam 83 and Is 17:1 - 4 should be on the horizon. He has great hope for the USA, but it's easy to see now the truth is the current administration is not only no pro Israel, but aligning themselves with The Muslim brotherhood, CAIR and the large international Muslim group. Obama is literally freightened of anything to do with Christ, the Bible or even symbols. He also has stated he intends to bring down America and Israel upon his 2nd term. Will he win again. We deal with powers and principalities and a great deal of voter fraud. Could be setting up quite the way he intends. I'm not sure what some of you are talking about that Bro Baxter doesn't back up his teachings. I'm watching his videos now and he clearly backs up his teachings. He backs up.his teachings in Revelation with Daniel and Zachariah. Everything he says makes sense and is clearly explained. It seems to me because he doesn't recognize the Trinitarian doctrine you want to discredit him but his teachings are biblically sound. I saw him recently on TBN with Perry Stone. I didn't understand anything that he was trying to say. Perry knows his scriptures very well. I don't even know why they had him on the air when most Christians don't even believe and agree to what he is saying. He thinks we will be here for part of the tribulation period. Well he can stay here if he wants, but when I hear that trumpet sound, I'll be out of here because I'm going with Jesus who has promised to spare us from God's wrath. Out of all the prophecy teachers out there today I agree with Bro. Baxter 90% of the time. He uses scripture to back up want he says. The only reason most people disagree with him is because it goes against the false doctrines they were raised with. It might shock some people but there are those in the United Pentecostal Church who disagree with him as well, but when they see that the church is here during the tribulation they'll wish they would have listened to him. Baxter is in it for the money. His website is full of merchandise dvds that sell in the hundred dollar range. yes dvds priced at $400 and $500. I attended a local church in which baxter preached at an end time conference. It felt like one giant infomercial,baxter would preach for 5 or 6 minutes then sell some dvds, preach for 5 or 6 more minutes and sell more dvds. The collection plate went around 2 or 3 times that night, baxter and the local pastor raked in the cash that night. I am pretty good at sensing if a man is really a christian or pretending to be. I shook baxters hand before he even began his conference and talked to him for a minute. And what a sensed was that this man is far from a christian. He was very arrogant and prideful. He is no different then jimmy swaggart and the rest of these guys who make a living off of Christianity. Jimmy regularly got $1,000 checks from followers. people need to understand many men decided to use bible and christ to make them self a nice bank account full of dough. I have been blessed to hear some of his teaching and preaching. I wish I could go with his tour to Israel this year. According to the book of Daniel, the ressurection/rapture will occur at at time when the antichrist has made his residence upon the temple mount. As a teacher of Irvin Baxter's material I will first and foremost say that this is a poor representation of his material. You not not only misquoted Irvin but you made statements based on tradition which have ZERO scriptural basis. Irvin is by far one of the most humble and knowledgeable prophetic teachers ever. His video packages aren't for HIS monetary benefit, it is to support his overseas tv programs, magazines,and Bible colleges to win over souls. Anyone who thinks Irvin is a money grabbing false prophet needs to see his car and house. Hardly fits the mold. God told Daniel that his words would be sealed up for those people of the endtimes. The reasoning behind this is to establish one final revival. 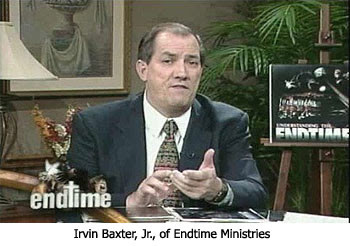 I listen to Irvin Baxter on TV and he makes more sense than any other prophecy preacher/teacher I have heard. He has common sense and intelligently explains things and does back it up with scripture. He doesn't appear prideful or arrogant at all. I have heard many Godly men preach about end times and most of them vary somewhat on their views and they are all very well meaning people who love the Lord. I'm not going to bash anyone for this. If something deals with a salvation issue, that's a different story. I think it's amazing that God said these things would be sealed up until the end times, that we would not be able to fully understand these things until then. I think we are truly able to make more sense out of all these things now. One last thing, we all need to ask God for wisdom and discernment, to help us understand, and stop criticizing people if they don't interpret things exactly as we do. May God Bless us all and help us all to understand what he is revealing to us. I was very glad to see that you had critiqued Irvin Baxter's teachings. I have great respect for you, Dr. Reagan, and for your ministry. It took about 10-15 minutes the first time I heard Irvin Baxter, to know that he was way off course. He has just enough truth to keep some people listening. Truth distorted can be more dangerous than an outright lie. Thank you for urging caution concerning Mr. Baxter's teachings. I hope your advice will be heeded. It is obvious, since the 6th seal, the 7th trumpet, and the 7th vial all describe the same event, that the seals, trumpets, and vials do not occur chronologically. Once that revelation is understood, and that it is this event (6th seal/7th trumpet/7th vial) that constitutes the wrath of God, the timing of end time events begins to make sense. Jesus, in Matthew 24, said the last trumpet (7th) will occur immediately AFTER the tribulation, the church will be raptured, then the wrath of God will be poured out. I never heard this until Irvin Baxter. Thank God for a ministry that will teach the truth! I've been watching Mr. Baxter for several months. His view concerning Daniel chapter 7 is the same as the view I came to 20 years ago. Today prophesy "experts" have mostly all been infected with certain doctrines that are not sound. One example is the Pre-Trib Rapture. This reviewer proves his false indoctrination on the subject when he references 2 Thess. chapter 2. 2 Thess. chapter 2 is Paul's description of the "Abomination of Desolation" spoke of by Daniel the Prophet and confirmed by Jesus Christ. Paul tells us how we will know the "Man of Sin" the "Son of Perdition" by what we see him do. He will sit in the temple of God professing himself to be God. Anyone can trace the timing of the Abomination of Desolation and see that it comes shortly after the first 42 months of the final 7 years. This means it happens in the mid-trib time era. This corresponds with the mandatory Mark of the Beast. The world will be faced with the "hour of temptation" which call come upon the whole world to try them. I could list various scriptures that indicate that Christian believers will be on earth at this time. These scriptures fly in the face of the Pre-Trib rapture theory. Most of these seminary Doctor's of Divinity, etc. are brainwashed with this false doctrine. I don't agree with Mr. Baxter on the timing of the "rapture" which is really the "first resurrection." But I do agree with a lot of his conclusions about the "Beast" and the woman who rides the beast. Just because these modern day "prophecy experts" don't agree with him or confirm his views doesn't mean Mr. Baxter is a false prophet. They may be the false prophets. I have recently bought some of his dvds and want to know more about bible prophecy. I have been looking at many people but my question is. If everybody is a false prophet who is not a false prophet? I guess I need to need to get in the bible about prophetcy more. I haven't checked him out that well. I know Jack Van Impe have the same problem and Hal Lindsey who is legit in these last days? does misquote Mr Baxter so be careful. I am ordained and 81 yrs old so I know a little more than the average seminary student. I also studied Hebrew for 5 yrs and if you haven't you have no idea why Jesus was baptized. One more word about following one person and no others. I notice Mr Reagan believes in Trinity. There is no such thing. Jesus said He and the Father are one. You can't divide one. Trinity teaching was started by a man named Arian (Google it) after 200 Ad. This was discussed at the Nicene Conf. Many church fathers did not agree with this teaching. Elohim in Hebrew in Gen 1 has nothing to do with Father, Son and Holy Ghost. It is plural because it is masculine and fenine. It refers to God and all of his creation which includes angels. Notice that is the only word used for God in Gen 1. In Gen 2-3 the words Lord and God are used 20 or so times. The word Adonai is Lord and refers to the covenant God along with Elohim the creator God. Hebrew. Jesus was God in human flesh not another individual. His final crowning of course was being baptized before he received the Holy Spirit. Why was he baptized if He had not sinned?? John, my denying the fundamental biblical teaching of the Trinity you've only substantiated Dr. Reagan's analysis of Baxter. The whole Unitarian argument dies at the Creation "in our image" (Gen. 1:26), Jesus' baptism (Matt. 3:13-17), Transfiguration (Lk. 9:28-36), and Crucifixion (Mk. 15:33-34), among other references. The Bible is full of evidence that God is one entity in three separate and distinct parts. There is but ONE GOD!!! His name is Jesus!!! 28And Thomas answered and said unto him, My Lord and my God. 29[Jesus saith unto him, ] Thomas, because thou hast seen me, thou hast believed: blessed are they that have not seen, and yet have believed. Mr. Baxter might be wrong eschatologically, but I doubt that his personal belief about the Trinity is much different from a genuine Christian's. I've seen his show many times, and though I disagree with him, he has a deep love of Israel and God's Word, no matter how flawed his eschatological interperatations. It concerns me that L & L would so callously reject Rev Baxter and his insights. I fear you may have been with the Pharisees of Jesus' day since you seem to be unwilling to have an open mind since the "end times" might not be just as you imagined. The second coming may be just as far from what the "mainline" believers as was the first coming of Christ ! All one has to do is listen to the first minute of Irvin Baxter's radio/TV shoe to know the man is a false prophet. His byline is "Politics determines how we'll live here on earth. Religion determines how we'll live forever" which is total heresy. Religion does not determine how we'll live forever, our relationship with Christ (or lack of) determines how we will live forever. He has replaced the Supreme Sacrifice of our Lord and Savior Jesus Christ with religion. That is total heresy. In Hebrews 1:3 Jesus is said to be the express image of God. never to be seperated again. Mary was concieved of the Holy Ghost but calls on the Father. of the invisible God, the firstborn of every creature:"
down to Sodom and Gommorah, met with Abraham. If you trinity believers would research history, and the Bible you would find the Catholic Church in Rev. 17 is the great Whore and she is the Mother of Harlots. The Whore has changed all the teachings of the 12 Apostles,she invented the trinity!The Greek philosopher(Justin)a non Christian started trying to explain the Bible between 130-180A.D.after all the Apostles and most of the Christians were killed.He stated the Father was a god and the son was a lesser god and laterhe decided the Holy Ghost was a god also.The year 325 A.D.is when the mode of baptism was changed to the Father,Son&Holy Ghost.The Harlots is Churches that came out of the Catholic Church starting in 1517 the reformation with Martin Luther. All the Churches keep the same baptism mode as the Catholic Church.The Catholic encyclopedia has this recorded,there is also 4 or 5 other encyclopedias that records this also.I don`t have all the names with me but it is in them.So if you belong to a Church that believes in the trinity then you belong to one of the harlots.I know this is hard on you if you believe in the trinity, I use to be one myself until I did my own research of history and the Bible and if you want to know the truth and not just believe the traditions of men handed down for 1800 years from the Whore your eyes will see the truth!You can not do this overnight.IN Rev God tells the people to come out of the Whore so you won`t be destroyed with her. If people would just believe God and not man they would be alot better off! If we believe the bible is the true word of God and we believe in the what Jesus said is truth then read Matthew 24 and your pre-rap theory will disappear. I fear the mindset of those who have been deceived in thinking that they wont have to endure any of the hardships of the tribulation and then find themselves here when it occurs. My real heartbreak comes when I read articles from good Christian people who find it necessary to batter other children of God because of theology taught that may be not in line with what they believe. The Rapture I regard as one of those grey areas of scripture because so many have backed up their different viewpoints with scripture and all sound legite in there respective studies. Bottom Line is Jesus is coming back and whether we believe its before during or after we must be ready regardless. Our salvation is not based on this issue but whether we believe Jesus said who He was is truth. There is much to do before Our Lord returns and the Harvest is plentiful. I am not here to judge those who claim to have a personal relationship with Jesus but rather to reach those who do not. God will convict those who make false claims and I am not worthy to do His job for Him. Remember Heb 4-13.
irvin baxter is not a false teacher. i listen to irvin baxter and i highly recommended people to go to irvin baxter's website and can always call him and know more about his theology. if you really want to know why he believe's the seals and trumpets already happened he gives a different view on it that it already it happened. i used to be against to what he said till i listen to his 7 trumpets dvd on tbn archives and will islam rule the world on tbn archives. type in there at tbn archives end of the age with irvin baxter. david reagen has a problem with it because he don't teach it. Numbers don't qualify anyone. You can't claim that someone is a false prophet because few other teachers agree with him. Few teachers in Jesus' day recognized Him as Messiah. In Kings 22, four hundred prophets told the king of Israel that he would succeed in battle—only one told him the truth, that he would surely fall. I'm not saying that Mr. Baxter is the lone revealer of truth, only that the fact that others disagree with him doesn't Biblically disqualify him. "38 For in the days before the flood, people were eating and drinking, marrying and giving in marriage, up to the day Noah entered the ark; 39 and they knew nothing about what would happen until the flood came and took them all away. That is how it will be at the coming of the Son of Man. 40 Two men will be in the field; one will be taken and the other left. 41 Two women will be grinding with a hand mill; one will be taken and the other left. 42 “Therefore keep watch, because you do not know on what day your Lord will come. 43 But understand this: If the owner of the house had known at what time of night the thief was coming, he would have kept watch and would not have let his house be broken into." How can a post-tribulation rapture be so surprising and secretive? All Christians will know it is coming if all of the end time events have occurred. To me, the above verses destroy the post tribulation theory. What a person does not believe in the trinity then I automatically quit listening. This is an essential. Baxter was an apostolic pastor and carries this over into his ministry of today. Another reason that the pre-trib rapture is not true is found in the book of Daniel. Do you see it? I never noticed it before. The anti-christ will be revealed and take residence in the Holy Mountain prior to the rapture (resurrection). Many years later, Paul also predicted that the anti-christ would come prior the rapture. (2 Thess. 2:3 "... for that day shall not come , except there come a falling away first, and that man of sin be revealed, the son of perdition." I think that those who dismiss the Trinity doctrine may have overlooked an important part of the matter which is that in the Old Testament in the very first verse in the Bible the scripture says "In the beginning God..." word for God is Elohiym (Strong's 433) which is a plural noun. Genesis begins to introduce the Triune Godhead from the beginning of the scriptures. Regarding Pastor Baxter, I think that Dr Reagan has been overly harsh regarding his critique and may not be fully informed regarding the order of events in Revelation regarding the seals, bowls trumpets. If I could underscore this, it would be don't overlook any of the details of Revelation. CI Scofield delivered a template to our generation that is somewhat flawed by including assumptions that are not correct and avoiding mention of other matters and using a word like rapture that is not included anywhere in the NT account. I have been aware of Mr. Baxter for a few years and he is clearly someone who has gone through the bible wearing his own special spectacles in which, wouldn't you know, a lion represents Great Britain to his mind and a bear represents Russia. Clearly he is taking in lots of money and he alleges he has sent mass mailings to persons in Israelis urging them to collect at the Prophecy Conference Center he is building in Jerusalem when they are aware of the "abomination of desolation" being set up in the temple, as if a totalitarian, satanic leader would tolerate his presence in such a day or miss a chance to kill any Israeli who shows any sign of opposing him, even by trying to attend Baxter's wacky conference. Though many of us might quibble about this or that point with this or that expositor, Baxter's stuff is about the craziest stuff out there outside of the previously recognized cults. He is doing a lot of damage to the Christian testimony and, incredibly, apparently thiving while doing so,..for now. The situation with Mr. Baxter is heating up. ON the 6/20/2013 edition of TBN's "Behind the Scenes" with founder & CEO, Paul Crouch Sr., and his heir-apparent, Matt Crouch presented how Matt Crouch has met with a "prophet" there in Israel, where the Crouches have spent a lot of time of late as they have recently achieved a long-time goal of having a TV studio and broadcast center, the name of this "prophet" being "Samuel." "Samuel" had given his "prophecy" in person to Matt and written it down by hand on a piece of paper to present to Paul Sr. "Samuel" claims as a message from God that TBN will be there in Israel when the Antichrist arrives to rebuke him. Paul Sr. accepts as an indication that "Samuel" is a prophet of God the feelings that Matt had when listening to him, which Paul Sr. too as "the witness of the Spirit," though he is going to forward copies of the written prophecy to Irvin Baxter and Hal Lindsdy (I wonder how Hal feels about being mentioned in the same breath with Mr. Baxter?) though he plans to have "Samuel" on the "Praise the Lord" program imminently with Baxter. We all should pray about this situation as this clearly will likely tar by association somewhat the sound ministries that appear on TBN as well, such as Billy Graham, David Jeremiah, Max Lucado, Charles Stanley, Ed Young Sr.,Charles Stanley, Ed Hinson, Hal Lindsey, Jack Graham, Bill Purvis, James Merritt, Michael Yousef, etc. I suspect that "Christ in Prophecy" may want to delay posting this in order to investigate or maybe not post it at all, but at least "Christ in Prophecy" will be advised of this issue, if they don't know already. You are truly deceived my friend, Read the word for yourself, and ask the Holy Spirt to reveal the written word to you. I enjoy several prophecy shows, including Lamb & Lion Ministries. A couple of points I'd like to add to this discussion. In the Olivet Discourse Jesus makes no mention of a pre-trib rapture, but mentions the Second coming at the end of the Great Tribulation. In Thessalonians Paul taught that the rapture cannot happen before the resurrection of the Christian dead. (Dead in Christ MUST rise first) In Revelation, John clearly reveals that the 1st resurrection of the dead is not until the Second Coming of Christ at the end of the tribulation. This rules out a resurrection of the dead/rapture at the start of the Great Trib. I don't necessarily like it, but that is the way Scripture reads. I don't always like it, but I realize that my believing in a pre-trib rapture does not make it so, any more than my wishing for it to be true will make it true. The timing of the rapture will be what it will be according to God's playbook, not mine. I enjoyed the "Left Behind" books even though they unfolded end times from a pre-trib perspective. But I enjoyed another great end times book titled "Redemption Road" by Jameson Taylor. I found it at Amazon.com. Concerning the "imminent" return of Christ referenced by some comments: There is an interesting statement made by Jesus that few of the famous prophecy "experts" have dealt with. Jesus said that "unless those days were shortened, no flesh would survive" (Jesus was speaking of the Great Tribulation) Jesus continued, "but for the sake of the elect, those days WILL BE shortened." Hmmmm. So the days of the Great Tribulation will be shortened. the Great Tribulation won't be a full seven years like Daniel was originally told so once the events of Revelation unfold, it would be impossible to know when it will end. Only God alone knows the day or the hour, as Jesus said. The Great Trib will be LESS however many days God has decided to shorten them. That could be why no one will know when the Second Coming/Rapture will happen. No one has been told how many days God will shorten the Great Trib period, only that those days WILL Be shortened. So within the Great Trib period, the Second Coming will still be "imminent" since no one will be able to predict by how many days God will shorten that period. Once the 3 1/2 year mark hits and the abomination of desolation takes place, the rapture/second coming could happen at any time. The Antichrist's persecution of the saints unfolds, and then God will shorten those days of persecution...but by how much? One day? One year? 3 1/2 years? (Mid Trib?) My point is simple. Careful study raises more questions than provides answers. There is far too much dogmatism in all of the prophecy camps to suit me. My counsel to all Christians is to listen like the Bereans. Study the Scriptures yourself and consider all views, then make up your own mind. That's what I liked about "Redemption Road." Jameson Taylor did a nice job blending the essentials of the gospel with end times fiction. He nailed it. You can take or leave his end times views and still enjoy contemplating the ideas he sets forth. Very stimulating reading. But he seems to get it. Saving souls has to always be our primary focus, even in the end times. In light of such divergence between professing "Christian" teachers across the spectrum of theology concerning communion, baptism, alcohol use, women in ministry, homosexuality, the Trinity, the Divinity of Christ (not just divergent views on prophecy), I'd say we should scrutinize all Bible teachers, not only Irvin Baxter. In the end, let Scripture alone speak loud and clear on all of these issues. The great falling away will be those Christians who believed in a pre trib rapture. When the war from the Euphrates River region starts and ends one third of mankind will be destroyed. The USA may or may not suffer from this war, but after it has happened, and it will happen, those who haven't been supposedly raptured away will probably lose their faith, thus, a a great falling away. Many will give up the faith and follow the anti Christ. Read Matt 24, 29-31, no better explaination than from King Jesus himself. Ive also seen many get very violent when someone believes the WORD, rather than some 1830's doctrine dreamed up by Maggie MacDonal and John Darby from Scotland. It's sad because I can see that his views have rubbed off on some people. I wouldn't call this man a false prophet per se, but he is definitely off. I have heard plenty of great teachings about a pre-trib rapture backed up very well by Scripture. I recommend Jack Van Impe's book called Revelation Revealed. It's a step by step walk through the book, verse by verse. He makes it very easy to understand the book. I wish they would take his program off of the air because he is not in agreement with the Bible. We are not here for the Tribulation at all. It is not for us. It is judgment for the unbelievers. One thing that caught me is that he doens't think that Revelation is written in chronological order. That's a big issue here and this is the reason why he is off. We are raptured in chapter 4 then the 21 judgments start. Thank God we are not here for that. I heard someone ask Irvin in the July 17th broadcast if Irvin was one of the 2 witness'es! Time to switch channels. No wonder the Holy Spirit caused me to forget the name of his ministry, and I really had to dig to find it again. It is true. The Holy Spirit will teach you all things. And don't forget prayer. I prayed yesterday that the LORD would keep the Jehovah's Witnesses out of town. I didn't pray for that this morning and there they were when I came back in town today. But I saw them high tailing it out of town when they saw me. There is no pre trib rapture. I believed in the pre trib rapture from 1086 to 2002. Open your eyes and see things clearly. Irvin is saying what I'm thinking. i would like to know, how is it that the bible talks about, one being taken and another left, is that not the rapture? Thank you so much for being brave enough to post Dr. Reagan. I have been very interested in I.Baxter's point of view, except the huge red flag for me from the beginning is he is not pre-tribulation rapture, but post-trib. The Spirit based on Scripture just doesn't bare witness to post-trib. All of the evangelical ministers I am aware of are pre-trib and Baxter is the only one who is not. So who am I going to believe? The Scriptures and the majority view. If pre-trib then Christ's return is imminent at any moment. Baxter's view destroys imminency taught in holy Scripture. Wise up Baxter! This is the problem with the Church today. We are too busy trying to tear each other down. You and Irvin are brothers in Christ. Yes you have different views on end time events; however, your belief in Christ Jesus should unite you and cause you to colaberate and learn from one another. All you did was look at his website and degrade him. I watch your show, Christ in Prophesy, and Irvin's show End of the Age. I learn from both. The point is to trust in God, beleive in His son Jesus Christ, and to be ready for His return, no matter how you interpret each individual end time scripture. I enjoy Irvin Baxter's prophecy show. On the other hand, I also enjoy L&L ministries as well as Prophecy in the News with Gary Stearman and Cornerstone with John Hagee. There are about even splits between the views of pre-trib vs post trib and both sides can back what they say with scripture. I just find it amazing how so many pastors get different view from the bible. Baxter is a false teacher and teaches a false unbiblical salvation. Yes, he is wrong about stating we are currently in the tribulation, but he is way off base in teaching that speaking in tongues is required for salvation. It is more than a different understanding of the Bible; what he teaches is false and cultish. It is crystal clear in 2 Thessalonians that antichrist CANNOT be revealed until the restraining force (clearly the church of Jesus Christ), not the denomination, but the body of believers, is taken out of the way. This lines up with Jesus teachings in the Gospel accounts that believers will be kept FROM the hour of judgement coming on the earth. It also lines up with Paul's teaching in 1 Thessalonians 4 that the body of believers will be caught up to meet Christ in the clouds. When Christ returns to reign, He touches down. Further, there's the marriage supper of the Lamb: (Christ to His church), and in Jewish tradition, there is seven years of preparation before a wedding. Again, clearly, this period of preparation occurs during tribulation in the heavenly City of God, the one in which God Himself returns to earth in after the millennial reign of Christ AND the believers who return with Him to reign with Him (Christ) for that 1,000 years. It doesn't get any clearer than that. Rapture is eminent. The end of tribulation is not. That time will be tied to the seven-year peace treaty antichrist will make with Israel. Christ says "Be ready." and that He Himself does not know when that day or hour is, "but the Father only." is the truth. It's pretty obvious that we have pretrib believers, midtrib believers, and post trib believers. Is it fair to say that 2 out of the 3 or not the truth? I have concerns about what is considered truth. It seems we need a love for the truth as the bible says. One concern that I have is the bible talks about lining the word of truth by line upon line and precept upon precept. I have a concern with so many salvation plans. Just as pre mid and post trib not all can be truth. My main concern is how did scripture be changed or interpreted in so many different beliefs yet they all believe their beliefs will be accepted by the Lord. For instance the bible says there is no other name in heaven or earth we can be saved except in the name of Jesus. Be true. His word is truth. When I searched how Jesus name baptism was changed it made me wonder who had the authority to change what Jesus taught his disciples? I researched it and found that Constantine and the Counncil were following the Tertullian theology. Then I had to make a decision. Did Jesus renoune his teachings of the disciples or did The Council of Nicea over rule Jesus' s teahings of Jesus name baptism. The truth should be found in the word of God in the bible. I read in the book of Acts many people were baptised in Jesus name but did not find one time that any one was ever baptised in the Titles of the Father Son and Holy Ghost. My next thought was why did the Protestant belivers leave the Catholic Church. It came back to truth. The Protestant believers did not believe what the Catholic Church was teaching. They read the Holy Bible for themselves. The concern then did the Council of Nicea change from the authority of God to the authority of man through the teachings of Tertullian? Wow! Maybe it cost money to be on the air and produce products that people are asking to receive. Just a need producing a need. We have the DVR recording Hal then Irvin. They both are good at putting me to sleep! But if they do, I'm sure to re-run their shows to see what they say. I thought Baxter was very clear in saying that your view of when the Rapture occurs IS NOT a salvation issue. Having been exposed to the Pre-trib scenario since 1972 by Lindsay, McDowell, Larkin & others, I've watched Baxter with suspicion. Shame on all of you violators of Matt 7:1 who piously claim your way is the only way! Now I only saw 1 poster mention the 'Mid-Trib' view & I don't know what justifies that view, but it may be so, because one of the most prayerful Christians I know is a mid-tribber. A problem that I have with Pre-Trib is that most Apologists describe the Rapture happening suddenly & immediately followed by the Trib. So those 'left behind' will have clear memory of all those Christians talking about the Rapture and the Tribulation and the ANTICHRIST! Even Hollywood knows about the Antichrist. They will certainly want to prove all those Christians wrong by not letting the antichrist character achieve power. They will assassinate him immediately. So my "THEORY" [not backed by any verses] is that there may be a period of time between the Rapture & the Trib. 3 years, 7 years, 25 years or a generation. This will allow the history revisionists to explain away what that Rapture thing was. Meanwhile, apostasy will ripen further to allow a great welcome to Mr. Antichrist. ... .Look how this generation has revised history from what happened in the 60s! I was always taught that the rapture would happen before the final 7 years and I accepted it. In 2009 when I started hearing about a new world order, I wanted to really understand prophecy, because I was excited about the rapture. I began getting into prophecy through reading my Bible and listening to different prophecy teachers. I started noticing that every time the Bible talked about the coming of the Lord that it was always about the 2nd coming at the end. I finally came across Irvin Baxter and his teachings corresponded with what I was reading in my Bible. I am still studying my Bible and listening to him, and I have to say he's right on. I encourage you that if you truly want to know truth, study your Bible, don't only listen to these prophecy teachers, but seek the truth by reading the word and comparing what they say to the Bible. This is what I have been doing and I'm at the point that the only one that is teaching exactly what I am seeing in the word of God is Irvin Baxter. He loves the truth and he's teaching it. I am so grateful for Irvin Baxter who is willing to go against the grain and teach the truth. I admire someone who prefers the praise of God rather than the praise of man. He is pouring himself into his ministry and he is reaching out to help the Jews in Judea. He is not only helping the Jews, but the whole world. I am so sad to see a person who claims to be a Christian like Reagan bash a man of God like Irvin Baxter. I will continue to support Mr. Baxter and excitedly continue to listen to him and watch prophecy unfold until the coming of the Lord. I listen to many prophecy preachers and I take something from them all. NO ONE is right. Everyone interprets things as they see it. You need to find out the truth for yourself. Do not depend on others for your insight of what is to come in this world. Dig into the Word of God and find out what it means to you. Ask the Holy Spirit to give you wisdom & understanding concerning these things. I think it is great that we have these people whom we can listen to, but ultimately there is only one who knows what will truly happen. Daniel 9:27 tells us that the Man of Lawlessness (the Antichrist) will be revealed when he makes a peace covenant with Israel for 7 years, starting the 7 years the Tribulation will take place. In 2 Thessalonians 2:1-3, Paul comforts the Church saying that they do not have to worry about that they’re in the Day of the Lord (the Tribulation) because the Antichrist hasn’t come on the scene. The last part of verse 3 and 4 then gives a short summary of the career of the Antichrist, saying his time will be used to have the world worship him, culminating in declaring himself to be God in the newly built Third Temple, and that eventually he will be doomed to destruction. Second Thessalonians gives us the full span of his career, not particularly focusing on one event, and it’s certainly isn’t a time indicator of when the Rapture will occur. The Bible lists 3 stages to the resurrection of the redeemed. Jesus was the first (1 Cor. 15:20), next the Church just before the Tribulation (1 Cor. 15:23), and thirdly at the end of the Tribulation the saints who died during the Tribulation and Old Testament saints (Dan. 12:1-2). The resurrection of the unjust all throughout history will occur at the Great White Throne Judgment at the end of the 1000 year Millennial Kingdom (Rev. 20:11-15). For more on the various resurrections, check out this article. There are only two resurrections separated by a thousand years. 20:13 And the sea gave up the dead which were in it; and death and hell 32 delivered up the dead which were in them: and they were judged every man according to their works. Proper study of the Bible requires one to study all the passages and in context concerning a topic, not picking and choosing select passages. A comprehensive study reveals there are two resurrections, but three stages to the first - Firstfruits, Harvest, and Gleanings. Again, read the article link. Just take God at His word. Opinions, speculations, and musings cannot replace his word. I was thinking the same thing myself. What happen to love thy neighbor. What does loving one's neighbor have to do with doctrinal soundness? Christians are commanded not to accept false teachings and to contend for the faith (1 Tim. 1:3; 6:20; Jd. 1:3). For information on why we believe the Pre-Tribulation Rapture is the best argument for the timing of the Rapture, please check out these articles on our website here and here and our "Christ in Prophecy" shows posted here. The great part of this site is the idea to carefully analyze what someone is saying. Their website content etc. is irrelevant as it show a disinterest in continual website development. The problem with this critique is that the person making the claims about what is being said, is not countering Baxter's conclusions with biblical reasons he is wrong. An ongoing thing with Baxter is his willingness to discuss his conclusions with anyone. Yet people grip about him on sites like these and fail to actually address anything with Baxter. He has a radio show and would be more than happy to conduct an open discussion, and has said so on many occasions. The simple fact is you can say his interpretation does not match a common sense meaning, but what you are actually saying means nothing. Common sense is relative to the person/s doing the interpreting. If he claims the animals represent countries, and you disagree, you must provide sound reasoning based on the bible to disagree. Otherwise you are just saying I disagree for no reason other than that does not make sense. When someone like Baxter, who I do not claim has all the answers, can demonstrate a thorough knowledge of the bible and many years of research (also ongoing) you cannot simply disagree to disagree otherwise your ignorance becomes evident. If he makes a claim which you think is suspicious just research it for yourself, and look for someone else of similar background which also disagrees and see what they have based their understanding on. The only fault I have found so far in Irvin Baxters teachings is clear to all of those listening to him, he fails to adequately discuss the great delusion. People continuously argue about things in the bible, and many claim to know everything. Yet I have yet to witness someone actually countering Baxter in an open forum, and actually backing up what they had to say. People that have a problem with true Biblical teachings such as the saints being here during the Tribulation deny such because they only desire to serve Jesus if they do not have to give up their life as a martyr! They desire the easy way out. Bashing Irvin Baxter will not change the course of the Bible. Numerous saints are going to be offended when they realize that they haven't been "raptured" when the man of perdition desires to slaughter the Holy people. Of course, we all desire a pre-trib rapture. I used to believe it, until one day I studied the Scriptures (years before I ever heard of Irvin Baxter) and I realized that there wasn't any Scripture to support a pre-trib rapture. I would love to take the easy way out. Who wouldn't? However, I realize that I can't change the Scriptures to suit my flesh! Also, there are not three Gods - only One. Isaiah confirmed that in addition to Jesus Himself. Is there a God beside Him? No! Funny there are so many so called prophecies of the end time and everyone thinks they are right. When Jesus came the first time there were also prophecies in the Old Testament about the coming savior and King, but Israel missed it, only a few understood the true prophecy. I wonder if the same thing will happen now at the end of the age, if so many will miss the prophecies and only a few will be right. A. I find it humorous that most everyone in the post is anonymous. C. Why bicker about the end times. Is it not more important that we reach as many people as possible before Christ's return for His Bride and be more concerned about spreading the Gospel instead of smearing it? All I know is I want my oil lamp full plus extra when the Lord returns and I don't want it half empty begging for more because I spent too much time arguing about the end times. Just be ready and get as many people to join you as possible. I grew up in a UPC church and still attend one. But that isn't going to amount to a hill of beans when Jesus comes back. Irvin Baxter isn't only a false prophecy teacher, he is a member of the Oneness Pentecostal cult. He denies the deity of the son as all Oneness Pentecostals do claiming the son is nothing more than a suit that the father wore, Oneness Pentecostals are against exegesis and hermeneutics. I was a member of the Oneness cult for 5 or 6 yrs, I know their doctrine like the back of my hand. I remember the first time I picked up a bible and started reading it, the Oneness church taught me that grace and faith didn't exist in the old testament and that we are saved by our good deeds which includes tithing, attending church on Sundays and water baptism. Amazing my surprise when I read from Genesis through Deuteronomy and it was about grace and faith. As a oneness Pentecostal we were instructed never to attempt to read the bible ourselves unless an elder of the church was present, we were also taught that the pastor has more authority than the bible. I remember discussing salvation with my 2nd cousin who attended church there after I left and her telling me that calling on Jesus and believing in him saves no one and that salvation is by good deeds and water baptism, I then showed her scripture in the new testament on grace through faith and asked her if she believed what she read. She shook her head and says "I dunno, I trust brother Ted over the King James bible because he is St. Peter on earth. (brother Ted is the pastor to her church) that is another doctrine they teach is taking acts 2:38 out of context and stating that Paul was not the apostle to the gentiles but that Peter was, then they quote a verse of scripture about the keys to the kingdom that was given to Peter, then the Oneness Pentecostal pastor claims he is a type of St. Peter on earth and salvation is only available through him because they teach as a type of Peter he is the mediator between God and man and when the pastor water baptizes you he can get your sins forgiven for you. The whole church is basically a giant rip off of various religions, they burrow from Jehovah's witness and Catholicism doctrine, even though they blame the Catholic church for everything. I posted the text below on 03/16/2014 and have periodically checked for a response. Interestingly, I have not seen a response but rather both posts entirely deleted… Fortunately I saved the text and am reposting it. I entirely understand the desire to moderate discussions in a way that promotes healthy dialogue rather than contention and chaos; however, I am somewhat concerned that there was no response simply wholesale deletion. Virtually everything the previous poster stated about the beliefs of "oneness" Pentecostals is false. I cannot be certain if this is intent to deceive readers or the result of being involved with a group that didn't know what they were teaching. Either way, these statements are incredibly misleading. Oneness Pentecostals very much believe in the deity of Christ. What they do not believe is the doctrine of the Trinity. From a historical standpoint this position is well founded as the doctrine of the trinity was created and codified in the 4th century. It is not a component of orthodox (apostolic) Christianity, it conflicts with strict Judaic monotheism and has been falsely taught to be a critical component of salvation in many Protestant circles. The whole of both the biblical and historical records bear witness that the doctrine of the trinity did not exist before the Catholic Church (which also changed baptismal formula). I spent most of my life in Baptist churches (including an SBC church). When I began to read the Bible for myself I began to realize that much of what has been taught is rehashed/reworked Catholic/Lutheran doctrine and most of it is not strict Bible but philosophical interpretation. Oneness Pentecostals present an alternate (dissenting) view of many critical issues. In some cases they teach and enforce "holiness standards" (which are problematic for a number of reasons) but it should be noted that these are the same standards used by other Pentecostal groups in years past and there are oneness groups that do not teach them. In regards to Irvin Baxter's view of end time prophecy, time will tell... Sadly, most of us have accepted as fact a pre-tribulation rapture; however, an honest, objective reading of the entirety if scripture does not bear this out. I would like it to be an accurate interpretation but it isn't. I have a feeling that when we see the abomination of desolation standing in the Holy place many "Christians" will fall away because they were expecting a pre-tribulation rapture that didn't happen. Muslims believe in Christ and deny he was the son of God that died on the cross, and that he is just a human prophet. So just because you believe in a Christ doesn't mean you believe in the Christ of the bible. 4th century is from 301-400 AD. The Oneness Pentecostal church teaches the trinity was made at the council of nicea 325 AD, yet we know this is not true, because there was a song wrote about the trinity in 150 AD called "hail gladdening light"
now unto the deny of the son, all cults deny the deity of Christ in some form or fashion, Islam denies Jesus is the son of God and that he died on the cross, Black Hebrew Israelite cult states Christ wasn't born of a virgin but that he is biological son of Joseph,Jehovah's witnesses states the son is a god and not the God and that god they believe he is, is the angel michael. Oneness is in the same category because they state the son is not eternal he is is just a regular human that God the father indwell. Oneness Pentecostals like to play a game of going back and forth using the name Jesus one minute to refer top the father and then the next minute the son. So I will use the terms father and son from now on. Oneness denies the deity of the son and says he is a created being, a suit of flesh that the father wore. Not to mention the demonic activity in the Oneness church, the tongues they speak are not from God by are demonic in nature. Those in the Oneness church have no salvation, because they teach works, deny the deity of the son, and let unclean spirits live in their bodies. Oneness Pentecostalism is a satanic religion. 2 Thess 2:7, "until he be taken out of the way." The Greek word for 'taken' is in the KJV Bible 678 times and is translated "taken" one time. The Greek word for 'way' is in the KJV 61 times and is translated "way" less than 5 times. If the Greek word for 'taken' had been translated " to come into existence, begin to be, or to appear in history" and "way" had been translated "midst or middle" as it is every where else in our Bibles, we would have a completely different idea of what will happen in the end. 2 Thess 2:7, 'out of the middle he comes", just like Daniel 9:27 said he would - "in the midst of the week". Nobody is taken out of the way. Thank you for your reply. I will respond to your comments as you did mine (your comments bracketed). This is not a scriptural rebuttal of the argument presented. All scriptures “oneness” Pentecostals use in discussion of the nature of God points to the deity of Christ (1 Tim 3:16, Isaiah 9:6, etc). You are using a hysterical emotional argument to try to “win” rather than rebutting using scripture. Please look up the meaning of the word “codified.” Furthermore, given that I hold an undergraduate degree in music (from a secular institution) I immediately question your assertion here. The text of which you speak was written in ancient Greek (entitled Phos Hilarion) later transliterated into English. The original text does not contain the word “Trinity.” The text makes a reference similar to the one found in 1 John 5:7 (which also does not contain the word “Trinity”). The text of the Trinity doctrine as codified by the Catholic (Universal) Church, is not simply a reference to Father, Son and Holy Spirit. Again, this is a hysterical, emotional argument without basis or support. I will assume that you speak from your experience in this area. However, I should note, that in any discussion, anecdotal evidence tends to be considered spurious. Using anecdotal evidence you can argue anything you like without support but that doesn’t make it true. If we are going to ignore scholarship and scripture then perhaps I should just say, I imagine that I have personally know a far greater number of “oneness” Pentecostal ministers than you. I have yet to hear the falsehoods you describe. If someone is preaching what you describe they are wrong. They also no more represent the entire “oneness” Pentecostal movement than Jim Baker, Ted Haggard or Benny Hinn represent all Trinitarians. This does not declare that the Father and Son are co-equal, co-eternal beings (Trinity doctrine according to its original and persistent Catholic incarnation). It is a reference to John 1:1 (which does not say what Trinitarians claim it does). You are correct. This is a scripture “oneness” Pentecostals use to prove the deity of Christ (despite your claiming they don’t believe that). Paul also writes, “ Beware lest any man spoil you through philosophy and vain deceit, after the tradition of men, after the rudiments of the world, and not after Christ.9 For in him dwelleth all the fulness of the Godhead bodily. (Col 2:8-9, KJV)” The doctrine of the Trinity is a philosophical one. Faced with a seemingly paradoxical divine mystery (1 Tim 3:16) theologians constructed a framework through which they could understand God’s nature and relate it to others. That said, it is still a philosophy (see Paul’s warning above). If I were you I would tread lightly here. I will remain respectful of your position and beliefs. I see no reason to malign you. I would, however, caution you when you speak of these things. 31 Wherefore I say unto you, All manner of sin and blasphemy shall be forgiven unto men: but the blasphemy against the Holy Ghost shall not be forgiven unto men (Matt 12:31). I will also note (though it seems to be a theme) that you have not produced one shred of evidence (with the exception of your own “experience” to support your claims). My experience with individuals and congregations with these beliefs does not harmonize with yours. The facts (the doctrinal statements of the major “oneness” Pentecostal organizations) does not support your claims either. This leads me to question a) your motives and b) your sources. My initial argument was that the statements about what “oneness” Pentecostals believe were false. Perhaps you should consider asking rather than telling… However, we seem to have deviated toward something more fundamental (the veracity of the Trinity doctrine). Interestingly, the Bible does not contain, the words, co-equal, co-eternal, Trinity, Tri-unity, etc. I know the standard argument here so please don’t go into it. The fact remains that the doctrine was written by human beings who were not authors of the old or new testaments. It was agreed upon and codified well after Jesus’ death and resurrection. If you choose to remain convinced of its veracity that is, of course, your prerogative. But in regards to “oneness” Pentecostals, please at least attempt to be accurate (or at least acknowledge that the people you have known may have been completely wrong and not representative of other “oneness” groups). In response to the satantic Oneness pentecostal poster. Wrong, Colossians 1:16 goes against the very foundation of Oneness Pentecostalism, for Oneness states the son did not exist till Mary's baby, in which the father wore the sons flesh like a suit of clothes. Oneness states the son did not exist in eternity past nor did he create the heavens and the earth, for the son is the child of Mary only. Colossians 1:16 says the son created all things in heaven and in earth. You're actually trying to deceive people in the comments you left me by ignoring context of all scripture and instead treading forward telling lies in order to deceive people to convert them to your false religion. A common ploy by Oneness is to twist the meaning of Colossians 2:9 For in him dwelleth all the fulness of the Godhead bodily. You use Colossians 2:9 to make us believe that the word fulness means all the father dwells in the sons body, but yet we see that all the fulness of God dwells in the Christian's body, so according to your logic Christian's are also God the father. blasphemy of the holy ghost is not calling out the unfruitful works of darkness in the false Oneness church, a church that was started in the year 1915 by R.E. McAlister. Your church is a false religious system that denies the deity of the son and claims the son is only Mary's baby. You also have no provided one shred of evidence for Oneness Pentecostalism at all, while anyone who reads the bible can see the trinity all through the bible. I don't believe everything I hear from ANY teacher or prophecy scholar because God gave me my own brain. However, Baxter stays up-to-date on what's going on in the world, including the apple of God's eye--Israel. I get more history in appliance with Scripture from him than any other teacher/preacher I listen to. He's certainly better than any news show. I don't believe or even understand everything he contends, but I believe in, as well as share, his passion, and will always watch and listen to what he, as well as all other self-proclaimed "experts" have to say. It's how I stay up with what's going on. And, folks, they all sell what they have for money. Does that make them all charlatans, or laborers worthy of their hire? I'll let God decide. I am concerned for.the poor soul that wrote the on March 24 about oneness being demonic. I am shocked that ignorance like this really exist. He/she is really in tune with "red flag" that wrote the critique on Rev. Baxter. I plead with you read the Bible for yourself. All the Islamic flags that I see on National News are Black. Where are the Green ones that Baxter describes.....is that a read Flag? I studied Bible prophesy for years and sat under the teachings of Bible scholars, as well. The first time I heard Irvin Baxter, I said to myself "Finally, someone who teaches the truth about the rapture." I had disagreed with all the other teachers all along regarding the rapture. The Bible says at the LAST trump that the dead in Christ shall rise, etc. (In a moment, in the twinkling of an eye, at the last trump: for the trumpet shall sound, and the dead shall be raised incorruptible, and we shall be changed.) Also, as stated in Revelation: And it was given unto him to make war with the saints, and to overcome them: and power was given him over all kindreds, and tongues, and nations. If the rapture has occurred, then who are the "saints" in this passage? Also, correct me if I'm wrong, but I never read where the 7 trumpets are blown within a 7 or 3 1/2 year period. Mr. Baxter makes excellent points correlating prior world events with several of the trumpets. Noone is perfect, so just keep studying the Word of God and pray for all the teachers. We are a family and all in this together. God help us to overcome! Mr. Regan you speak of his belief on scripture you also bring up the Trinity. While not all Messianic Jews belief in the Trinity most do. They go back to the original Hebrew not the translations. The Messianic Jewish Alliance of America describes a belief in the Trinity describes God the Father (Abba), God the son (HaBen) and God the Holy Spirit (Ruach Hakodesh)so are you saying you understand the Translation better than they understand the original text in it's original form? Majority of Messianic Jewish people don't latch onto the Pre-Tribulation Rapture either. So the majority that does not you are saying they don't understand those original texts as well as yourself understand a Translation? Where the prophet's not Hebrew? Ezekiel, Daniel, Isaiah, and Jeremiah? They didn't write these things in Greek or the other gentile languages they were translated into those languages. Moses the author of the 5 Books didn't speak Greek or any other Gentile Language. It was written in Hebrew and they look at scripture in it's original form not translational form. Ultimately God will explain to us in his infinite wisdom what was meant by it. I would be quick though to exalt yourselves and your teachings over people who actually read the original text. Irvin Baxter is a good man. Irvin supports Israel 100% and does not support church replacement, period. You should know this if you studied his information or listened to any of his radio shows or dvds (which I have). I have been listening to Irvin and studying the Bible for years and he has given me great insight into many complex parts of the Bible. Is Irvin perfect? No human is. God does not expect any of his children to be perfect. The enemy has been working overtime keeping true Christians apart, especially as the approach of our Messiah nears. True Christians need to stick together. The times that we are in now and that are fast approaching REQUIRE this. I will pray for you, Dr. Reagan, that God softens your heart. God Bless you and your ministry, in the name of Jesus Christ. The Daniel 7 Kingdoms will exist when Christ returns, so why do we still pay attention to a teaching that has been around since at least John Wesley (1703 - 1791)? His new Testament notes were written in 1755... 11 years before the United States of America even existed. We are seeing Revelation and Daniel fulfilled before our very eyes. The old school prophecy teachers are just repeating interpretations for ages ago, who could not possibly understand which nations would be on earth when Christ returns. Irvin is teaching the truth, and the old hats can't seem to accept they've been teaching incorrect interpretation for decades. For those of you who think he's in it for the money, I'd like to inform you that you don't know a thing about his finances, how much he makes or how he utilizes the money he receives. Only God knows exactly what he does with his this. I disagree with those of you who claim that he is some sort of false prophet, as, all of the legitimate prophecy teachers are sometimes wrong with some of their teachings (we don't know it all, we are not God). I've been listening, watching and reading materials from many men and women of God, and, I personally believe Irivin Baxter has the most knowledge in this field. I've taught bible prophecy myself and have later discovered that I made a few mistakes, and, that does not make me a false prophet. Let us not talk more than we should, as, one day we will be judged for what we say. The Trinity isn't a pagan teaching. It's biblical. The main verses in the Bible concerning the Trinity are Genesis 1:25-26; 11:7; Isaiah 6:8; Zechariah 12:10; Luke 1:35; 3:21-22; John 14:16-17, 26; 15:26; 2 Cor. 13:14; Col. 2:9; and Phil. 2:10. Jesus tells us in John 14:5-9 that to see Jesus is to see the Father. "Thomas said to him, 'Lord, we don't know where you are going, so how can we know the way?' 6Jesus answered, 'I am the way and the truth and the life. No one comes to the Father except through me. 7If you really knew me, you would know my Father as well. From now on, you do know him and have seen him.' 8Philip said, 'Lord, show us the Father and that will be enough for us.' 9Jesus answered: 'Don't you know me, Philip, even after I have been among you such a long time? Anyone who has seen me has seen the Father. How can you say, 'Show us the Father'?" I am a student of prophecy. Irvin Baxter is basically giving his interpretation. Google Amazing Facts and you will truly be blessed. I find a lot of Dr. Reagan's comments are not as plain as he points out. Mr. Baxter on one of his episodes did address pre and post rapture theories. He concluded that whichever position was correct we should be waiting for Jesus' return. I find a lot of information in this article is his personal opinion and he doesn't have revelation knowledge. Anyone can read the bible but the Holy Spirit has to give understanding and revelation knowledge. Many of his views are very misleading to new or unlearned Christians. I discovered Irvin Baxter to my delight back in 1997 when the show I usually listened to was replaced with Politics and Religion, Irvin's end time prophecy Live call in radio show. In all of these years, he has remained a very kind and gentle person to all of his callers even when they were rude and abusive to him. I do not agree with Irvin on every point that he makes but I have learned many wonderful and valuable things over the years and consider him among the top online-radio-television teachers. I am not a robot who can not think for himself and I am in the scriptures 10 times more than listening to teachers telling me about the scriptures. I think if Mr. Reagan were to debate Irvin, he would certainly find himself in the presence of a Very Godly man who knows his bible. People should go to endtime.com and either listen live or to some of the many archived shows before they take the word of someone else about him. Irvin also has a live chat room during the show and free speech is allowed in there even if you disagree with Irvin on some things, which I do. I have never been told to "cool it" or threatened to be kicked out of the room because of my comments when I have taken a different position than Irvin's interpretation. After 17 years, I know the heart of this man and it is to get the message of the gospel out to the whole world and he has sacrificed everything to do it. He is a humble man and lives very humbly. I am not an "Irvinite" or a "Baxterite", I am a thinking and discerning believer who works very hard at rightly dividing the word of truth. Thank you Irvin Baxter and all of the other preachers and teachers who are fulfilling the Great Commission of our Master and Savior Yahushua Ha Moshiach - Jesus the Christ. I agree strongly with Dr. Reagan. I have studied prophecy since the sixties and Baxter is wrong on so much. He has a great deal for which to answer to God. Read your Bible and ask The Holy Spirit to reveal the truth to you as you study. Wake up, Anonymous. You are deceived. You obviously have not read it. Why is it called the great supper of God (not to be confused with the wedding feast of the lamb). The tribulation is God's judgment on this world and if it was satan's why his he grabbed, chained by the mighty angel and thrown into the abyss during the 1000 year reign of Christ? You are cunfusing one passage which is Satan being cast out of heaven and down to the earth and having great wrath because he knows his time is short. Do you not see that during the seal, trumpet and bowl judments where it says man still refuses to repent? Or how about when men beg the rocks and mountains to fall on them and kill them so they can escape the wrath of the Lamb? Read it my friend and stop having someone spoon feed you false teaching! If you truly are searching for truth and are not afraid of listening to different views, I encourage you to download and oof the free audio sermons, transcripts or videos by w a Criswell, who wad probably the greatest expositor of the bible in the 20th century. He has about 2 thousand sermons there and I would highly recommend you checking out his sermons on prophecy, which you can search by title, book, etc. You can even ask Baxter if he thinks Criswell was a accurate and great preachwr and he will tell you yes. How do you explain all 3 persons being there at Jesus baptism? Jesus was there of course, John saw the Holy Spirit descend as a dove and the Father's voice was heard to say, "This is my beloved Son, in whom I am well pleased". How about the transfiguration when he was with Peter, James and John? Jesus was transfigured and God said, "this is my Son, listen to Him", when Peter was trying to get Jesus to build shelters for Him, Moses and Elijah. I used to love hearing Ircin, but he cannot explain why he differs on the Greek and aramaic and Hebrew original text of the word where his interpretation differs from others. Again, check out someone who teaches with a mastery of the original language the scripture was written in, because every Greek word is critical. If you do not fear that you could have a change of mind, you will look further.I did. Now who is judging? The main thing is the apostles creed, which I am sure you agree is the one non-negotiable. I would not condemn other people that have differences then you that are not matters involving salvation, because you set yourself up as God and you enter into dangeroous territory when you do that. Just a friendly reminder there. Wow, you have been around a long time being over 916 years old. Just a few more years and you will bypass the oldest on record, Methusaluh! Are you saying that ones opinion of pretrib, postrib, no trib is the basis of whether one is saved? I thought it was accepting Jesus atoning death on the cross and His resurrection which proved His atoning work was approved and finished? I guess I was wrong? So you are saying if I renounce the trinity and a pre-trib rapture that I am in the exclusive club of heaven bound people then? Please clarify? I encourage reading many views. One is W A Criswell who has over a thousand sermons online for free download by audio, video or transcript. He was an expert in Gree and Hebrew and preached from the age of 17 until about 88. He was the greatest expository preacher since Spurgeon in my opinion. He took 18 years to preach through the Bible and it was basically verse by verse. Being an English scholar as well as having a doctorate in theology, he was very well educated, not that education is a requirement. However it is very important when interpreting scripture from the earliest manuscripts. That is where the rub is; because unless someone knows that context they are really starting with a handicap. His sermons are searchable by book, title, date, etc. Highly recommend his sermons on prophecy, Daniel or Revelation. God bless all and remember; the main thing to remember is we are commanded to love one another; that is how the world will know that we are His disciples. Also the only non-negotiable is Jesus Christ crucified, as Paul stated. His death purchased our pardon and accepting Him is the issue; everything else is fodder for the enemy to use to divide and conquer. He only comes to kill, steal and destroy. Do not give him that foothold. We need to pray for each other, dfor the lost and for this world. There is enough trouble as it is. Our struggle is not with flesh and blood......amen. My church sponsored a bible study with Dr. Regan's material and I have surfed Lion and Lamb website to read the articles. I have studied Perry Stone's work, Chuck Missler, Mark Biltz, Jonathan Cahn, and Irvin Baxter. I concluded long ago from reading the bible that the rapture didn't happen at the beginning. I have read arguments for pre, mid, and post tribulation raptures. I have concluded that it happens later in the tribulation period. What I have noticed about Dr. Regan is his constant bashing of other pastors if they don't adhere to his beliefs. I'm appalled that he would call himself Christian and put down another pastor for believing differently. I have found flaws in Dr. Regan's work. I have questions about some of Baxter's work. It has not deterred me from listening to either. And for the record, Baxter prophesied the fall of the Berlin wall before it happened. It came true. What has Regan prophesied about that came true? Stop back-biting and behave like a Christian. Unfortunately, Baxter is not the first and only prophecy teacher that Regan has slammed. I never hear Baxter slamming anyone else. God didn't say anywhere in His Word that the only person who knows the prophetic truth is Regan. He did tell us to study. I will continue to read and listen to material from Regan and Baxter and compare it to the scriptures with the understanding that I must be ready at all times. I will pray for Regan that he asks God to forgive him for becoming so prideful to think he has all the answers. Humility is sorely needed. Why is it everyone pro baxter is anonymous? I have,s fsmily member caught up in baxters cult. And it is a cult just as much as scientology.. hopefully the faithful will snap out of it before long. Well, if you have a problem with "Anonymous", then perhaps you should explain why YOU choose also to remain anonymous. I believe that what Irvin is teaching is Biblical. He always backs up what he says with scripture when I have heard him speak. I think what he is teaching makes more sense than most everything else I have ever been taught. He is a blessing!! I used to watch Irvin Baxter faithfully but one thing that made me do a double take was his comment about the scripture that says ''except the days be shortened...''. God apparently told I Bo's wife that He had already shortened each day time wise. That was so ridiculous, it was funny. So now God speaks through the prophet's wife and he takes it as truth. Careful, people. We are told to judge the prophets. In Daniel it's talking about the resurrection of the Old Testament Saints, not the Church, which was Raptured 7 years or so earlier. Sometimes radio callers to Irvin's show address him as Dr.Baxter, of which he is not. Mr. Baxter NEVER corrects them. Is it ethical for him to allow them to erroneously think he's achieved this degree? i cannot believe all the Dr. Reagan bashing on this thread. Lamb and Lion is clear about its doctrinal positions. of COURSE Dr. Reason is going to have issues with someone who does not believe in the Trinity, and who believes that many of the "seals" have already been "opened". you just can't have it both ways. i come to this site because i want to know what Scripture actually teaches. over the years, i have found Dr. Reagan to be consistent and willing to tackle subjects that other people avoid like the plague. would you rather he just "shut up" and allow heresy to be spread around? do you think Dr. Reagan ENJOYS having to write articles like this? i'm sure he would much rather avoid controversy and be liked by everyone. but if God has called him to this ministry (which i truly believe He has), then Dr. Reagan has an OBLIGATION to speak up when people are being deceived. what kind of teacher would he be if he kept quiet when the sheep are being led astray? too many people on this thread are attacking him personally, and i find this abhorrent. Dr. Reagan is not attacking Irving Baxter "personally", he is warning about this man's unscriptural doctrine. he is commanded to do this by our Lord Jesus. what kind of watchman on the wall would Dr. Reagan be if he said nothing while countless sheep fell under the teaching of a false prophet? personally, i am most grateful that ministries like Lamb and Lion are willing to speak the truth in love and warn us when there is a false teacher on the horizon. most of us do not have the time or resources to check out each and every prophecy teacher that comes down the track. thanks Dr. Reagan for all you do. you truly are the Dr. "Reason" in these times of false teaching. May The PEACE of our Lord JESUS be upon each and everyone of you who read. I'm very thankful for the teaching we have received from God's Holy Word through the years since my early youth: learning to follow what JESUS has said "search the scriptures" (to learn them for ourselves)as it is written in John 5.
cannot deny that JESUS Is The One Lord and God. (read Deuteronomy 6 and Mark 12 and all of John 1). There is "one Lord, one faith, one baptism" (read all of John 3, and Acts 2, and Ephesians 4). IT IS WRITTEN in Colossians 2 that JESUS Is "the fulness of the Godhead bodily". I have been, in the past, truly thankful for Lion Lamb ministries, however, have been deeply disappointed to read of these comments posted previously here online! We all must pray to be kept in the will of God. Souls should be encouraged to "search the scriptures" as JESUS has said. Irvin Baxter encourages the study of God's Word, and, as he is a truly Spirit filled teacher of God's Holy Word, (read I John 4), he has studied and shown himself approved of God as a workman who need not be ashamed "RIGHTLY dividing the word of truth" as the scripture says. Read II Timothy 2. Anyone desiring more church history, especially concerning the trinity, should research the Biblical studies that God has blessed David Bernard and Raymond Woodward to teach, and, in searching the scriptures must realize that JESUS Is The ONE Lord and God. Is America Babylon the great whose fate comes in 1 hour?